Since its opening June 20, 2017, Sweet Confections by K&M has been treating Artesians to a variety of baked goods sure to appeal to any sweet tooth. 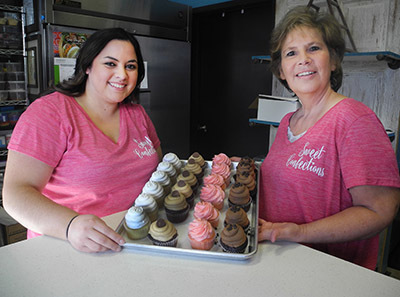 Owners Kayla Dominguez and Melissa Navarrette are realizing a dream by opening the sweet shop, which offers a daily selection of cupcakes, cookies, pies, bars, cake pops, and other goodies. Sweet Confections is also available for custom cake orders. “We are very excited to be a part of this wonderful community and appreciate how nice everyone has responded to us with kindness,” the two say. “We came to provide sweets for our community to make everyone smile. We love to bake and share our talent with you guys!” Sweet Confections by K&M, 314 W. Main St., is open from 10 a.m. -5 p.m. Monday – Friday and can be reached at 736-CAKE.